Russian rockets have accomplished many important firsts. The first artificial satellite, the first human spaceflight, the first probes to the Moon, and the first space station were all launched on Soviet and Russian rockets. Left to right: R-7 ICBM, Sputnik, Vostok (Luna), Vostok, Molniya, Voskhod, Soyuz, Progress, Soyuz-Fregat, UR500, Proton-K, Proton-K Blok-D (Zond), Proton-K Blok-DM (Integral), N1 Zenit-2, Zenit-3SL, Energia-Polyus, Energia-Buran, UR-100N Rockot, SS-20, SS-25, Start-1, Start, Angara 1.2PP, Angara 5, Human figure for scale (1.8m tall). First developed as an ICBM in the 1950's, the R-7 has become one of the most important rockets in the history of space exploration. 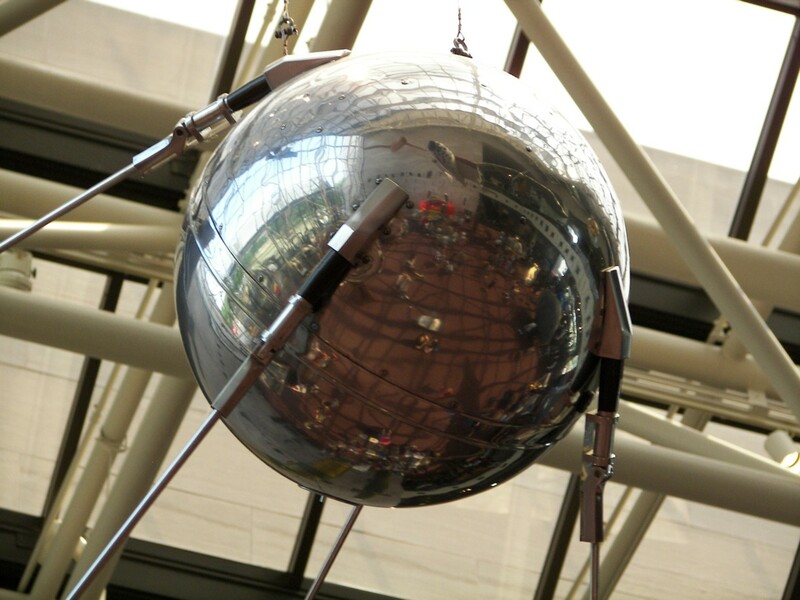 Sputnik 1, the first artificial satellite, was launched on an R-7 rocket on 4 October 1957. The basic R-7 rocket evolved with the addition of increasingly capable upper stages. Versions of the rocket would launch the first human into space, the first Lunar probes, even some of the first missions to Venus and Mars. Over 50 years after its first flight, descendents of the R-7 are still in regular use. Soyuz spacecraft continue to fly on what has become the worlds most reliable space launcher. The R-7 rocket is comprised of a core stage surrounded by four strap-on boosters. 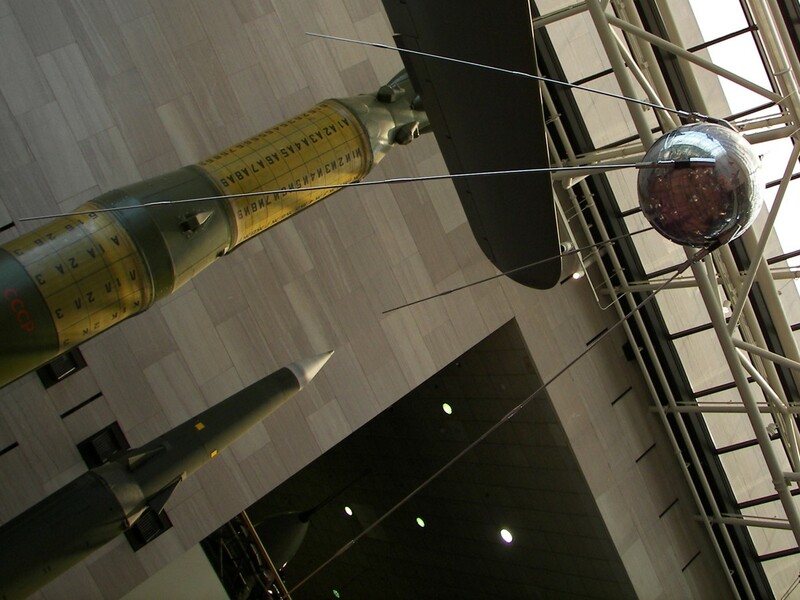 An instrument section and warhead rode on top of the core stage. The rocket first flew in 1957. The four strap-on boosters are considered to be the rockets first stage. Each booster is fueled with kerosene and liquid oxygen. An RD-107 rocket engine, at the base of each booster, has four main combustion chambers and two smaller vernier engines. The six combustion chambers share a single set of fuel pumps and are considered to be one engine. The boosters are identified as Blok- B, V, G, and D.
Several minutes into the flight, as the boosters exhaust their fuel, they drop away from the core booster. The core booster, identified as Blok-A is powered by an RD-108 rocket engine. The RD-108 is fueled with kerosene and liquid oxygen. The engine has four main combustion chambers and four, smaller, vernier chambers. Although the core booster is ignited while the rocket is still on the ground, it is considered to be the rockets second stage. The core contains more fuel then the strap-on boosters and continues to provide thrust after they are discarded. On 4 October 1957, a version of the R-7 rocket placed the first artificial satellite into Earth orbit. 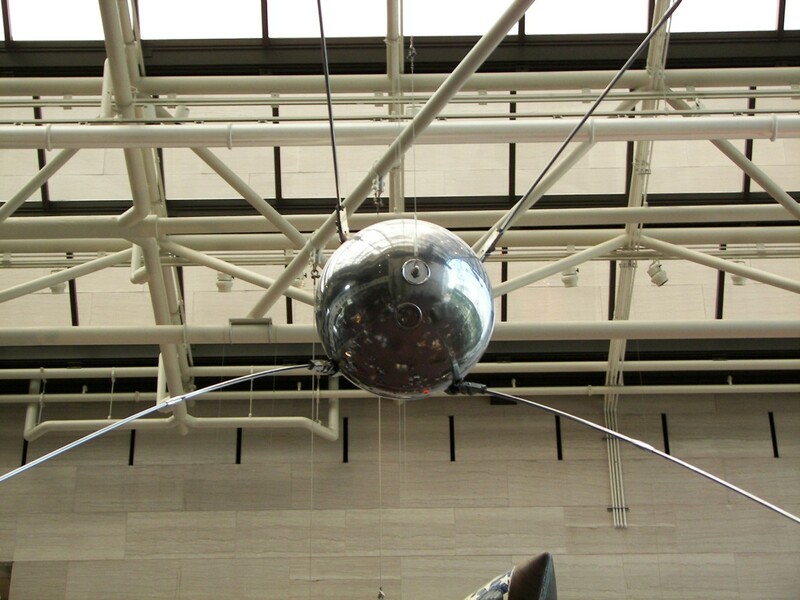 Sputnik 1 weighed 84 kg and included a transmitter that could be tracked from ground stations. 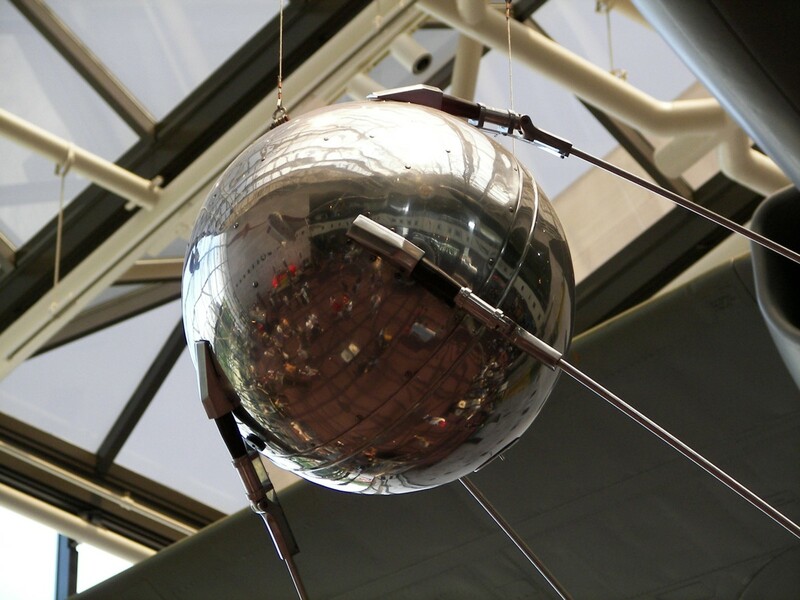 Sputnik 2, launched on 3 November 1957, carried a dog into orbit. Sputnik 3, launched on 15 May 1958, weighed over 1,300 kg and carried a variety of instruments to study conditions in low Earth orbit. 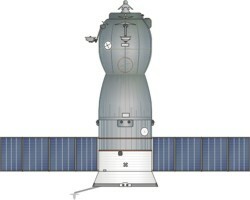 The Vostok configuration added an additional stage to the existing R-7 rocket. Known as a Blok-E, the upper stage was powered by an engine with one main thrust chamber, and four vernier chambers. The stage was supported above the Blok-A core booster by an open lattice-work structure. The Blok-E engine ignited while the rocket was still being accelerated by the core booster. This was necessary to ensure propellants were settled in their tanks. As Blok-E thrust built up, the core booster, nearly out of fuel, would be dropped. The Blok-E used kerosene and liquid oxygen as propellants. Initial flights of the Vostok booster launched Luna probes on trajectories toward the Moon. The first few attempts failed. On 2 January 1959, Luna 1, launched on a Vostok rocket, became the first spacecraft with sufficient velocity to enter solar orbit. Luna 2, launched on 14 September 1959, became the first spacecraft to impact the Moon. Luna 3, launched on 4 October 1959, became the first spacecraft to photograph the far side of the Moon. Several additional missions failed to reach the Moon. A large number of Earth observation, meteorological, and communication satellites were launched on Vostok rockets. Starting in 1960, the Vostok booster began to launch test versions of the Vostok space capsule. On 12 April 1961, Yuri Gagarin flew into space aboard Vostok 1. Gagarin became the first person to orbit the Earth. Five more Vostok missions were launched. Valentina Tereshkova, launched aboard Vostok 6 on 16 June 1963, became the first woman to fly in space. The Molniya rocket replaced the Vostok upper stage with the new Blok-I stage. The Blok-I featured four large combustion chambers, and four vernier chambers. The Blok-I, with its more powerful engine and larger fuel tanks, offered significantly better performance then the Blok-E stage from the Vostok rocket. Molniya rockets include a Blok-L upper-stage on top of the Blok-I. Molniya rockets were used to launch communication satellites and deep space missions. A large number of space probes were launched using this rocket. Although many early missions failed, some spectacular successes were achieved. Luna 9, the first spacecraft to soft-land on the Moon, was launched on a Molniya rocket on 31 January 1966. Luna 10, launched on 31 March 1966, was the first spacecraft to orbit the Moon. Missions to both Mars and Venus were launched on Molniya rockets. The Voskhod rocket uses the first three stages of the Molniya rocket. Voskhod rockets were designed specifically for missions to low Earth orbit. Voskhod rockets were used to launch several Voskhod spacecraft, including two crewed missions. Voskhod 1, launched on 12 October 1964, included the first three-person crew. 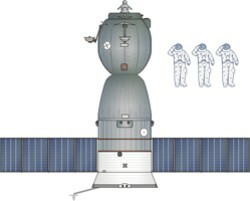 Voskhod 2, launched on 18 March 1965, included the first spacewalk. Connected to the spacecraft with a tether, Alexei Leonov spent around ten minutes drifting in space. The Soyuz rocket is comprised of a Blok-A core stage, surrounded by Blok-B, V, G, and D strap-on boosters. A Blok I serves as the upper stage. Soyuz spacecraft (right) are launched on Soyuz rockets. An escape tower, mounted on top of the payload shroud, has tractor rockets that can pull the capsule and crew safely away from the booster if needed. Soyuz rockets are used to launch Progress resupply ships. Based on the Soyuz spacecraft, Progress is used to deliver fuel, water, and other supplies to orbiting space stations. The first Progress mission lifted off on 20 January 1978. Since then over 125 missions have been flown. First flown on 8 February 2000, the Soyuz-Fregat is a commercial version of the Soyuz rocket. The Fregat upper stage (right) features a main propulsion system capable of being restarted several times. The stage uses nitrogen tetroxide (NTO) and unsymmetrical dimethyl hydrazine (UDMH) as propellants. Several payload fairings are available. The S fairing has a diameter of 3.715 m and a length of 7.700 m. The ST fairing has a diameter of 4.110 m and a length of 11.433 m.
First flown in the mid-1960's, the Proton family of rockets has played a critical role in the exploration of space. The Salyut and Mir space stations were launched on Proton rockets. A large number of space probes were launched on Proton, including missions to Mars, Venus, and the Moon. Several unmanned Zond capsules, based on components of the Soyuz spacecraft, were sent on Lunar flyby missions. Other Lunar missions included a pair of large Moon rovers launched in the 1970's, as well as several sample return missions that successfully collected lunar soil samples and delivered them to Earth. Proton continues to regularly launch communications satellites, scientific probes and other spacecraft. First flown on 16 July 1965. The rocket uses unsymmetrical dimethyl hydrazine for fuel, and nitrogen tetroxide as oxidizer. The two stage Proton was launched a total of four times during 1965 and 1966. Each mission carried a scientific satellite. One launch failed. Salyut and Mir space station modules were launched on Proton-K rockets. Two of the first International Space Station components, Zvezda and Zarya, were launched on Proton-K rockets. Proton-K Blok-D rockets added a Blok-D upper stage to the two-stage Proton. The Proton-K Blok-D was used to launch the Zond circumlunar missions. Zond spacecraft were designed to carry cosmonauts on circumlunar flights. Several unmanned missions were flown, but the program was cancelled before cosmonauts would fly. A variety of Lunar missions were launched on Proton-K Blok-D rockets. Luna 15, launched on 13 July 1969, was the first unmanned spacecraft to collect and return lunar samples to Earth. Luna 17, launched on 10 November 1970, landed the Lunokhod 1 lunar rover on the Moon. Lunokhod 1 travelled over 10 km on the Lunar surface. Another rover and several more sample return rovers were launched on Proton-K Blok-D rockets. The Proton-K Blok-DM first flew in 1974. Since then, dozens have been launched. The Blok-DM upperstage (right) is derived from the Blok-D stage. The stage features a restartable engine fueled with kerosene and liquid oxygen. Several variants of the Blok-DM stage are available depending on payload requirements. On 17 October 2002, a Proton-K Blok-DM2 launched the Integral Gamma-Ray Observatory. The Proton-M, first flown in 2001, incorporates several improvements over existing Proton rockets. A switch from an analog flight control system, to a digital system, as well as a number of other improvements, has produced a rocket with significantly greater performance then the Proton-K model. The Proton-M Briz-M features the Briz-M upper stage. The Briz-M, sometimes referred to as "Breeze M", is around 4 m in diameter and 2.65 m tall. The stage uses nitrogen tetroxide and unsymmetrical dimethylhydrazine as propellants. The Briz-M provides greater performance over the Blok-DM thanks to its unique fuel tank arrangement. Development of the N-1 began in the early 1960's. Four N-1 rockets were launched between 1969 and 1972. All missions failed to reach orbit. The first stage used 30 NK-33 engines. Propellants were kerosene and liquid oxygen. The second stage used eight NK-43 engines. Propellants were kerosene and liquid oxygen. The third stage used four NK-31 engines. Propellants were kerosene and liquid oxygen. For Lunar missions, the payload was known as the "L3 spacecraft complex". Designed to carry two crew members to Lunar orbit, and allow one person to land on the Moon, the L3 complex contained four main components. Included were two additional stages, known as Block G and Block D, the LK lunar lander, and the LOK spacecraft. Development of the Zenit family of boosters started in the early 1970s. Several versions have successfully served as satellite launchers. In the 1980's, a version of the Zenit first stage was used as strap-on boosters for the Energia family of boosters. The two-stage Zenit-2 rocket first flew in 1985. The first stage is powered by a four-chambered RD-171 rocket engine. An RD-120 engine powers the second stage. Both stages use kerosene and liquid oxygen as propellants. Using the first two stages from the Zenit-2, the Zenit-3SL adds a Block DM-SL third stage. The Block DM-SL can be restarted up to four times and is fueled with kerosene and liquid oxygen. Operated by the internationally owned Sea Launch corporation, the Zenit-3SL first lifted off in March 1999. The use of floating launch platforms allows the rockets to be launched close to the equator, improving performance for geostationary orbits. Nearly 30 Zenit-3SL rockets have been launched. The Zenit-3SLB, optimized for land launches, was first flown in 2008. The vehicle operates from Launch Complex 45, at the Baikonur Cosmodrome in Kazakhstan. Development of the Energia rocket began during the mid-1970's. The rocket was comprised of a large core stage surrounded by four strap-on boosters. The payload was mounted on the side of the rocket. Two Energia rockets were flown before the program ended. Payloads included the Polyus space spacecraft, launched in 1987, and the Buran space shuttle, launched in 1988. The booster performed satisfactorily on both missions. Both missions flew from Baikonur Cosmodrome in Kazakhstan. Four RD-0120 engines were mounted to the base of the core stage. The RD-0120 engines were fueled with liquid hydrogen and liquid oxygen. Each booster was powered by an RD-170 engine. The RD-170 was a four-chambered engine fueled with kerosene and liquid oxygen. The first Energia launch, occurring on 15 May 1987, carried the Polyus spacecraft as payload. The massive spacecraft was intended to test a variety of military space technologies. Although the Energia rocket performed as planned, problems with the Polyus spacecraft resulted in a failure to reach orbit. The second Energia mission launched the Soviet space shuttle, Buran, on 15 November 1988. Buran completed two orbits before returning to make a runway landing. The Rockot family of space launchers was developed from the UR-100N ICBM. The UR-100N ICBM, also known as the SS-19 Stiletto, was developed in the 1960's and 1970's by the Soviet Union. Both stages of the two-stage rocket use N2O4 and UDMH as propellants. Rockot uses the first two stages of the UR-100N missile. A Briz-KM third stage is added to increase performance. The Briz-KM features a restartable main engine, and is fueled with N2O4 and UDMH. A commercial version of Rockot is currently operated by EUROCKOT launch services. Payloads have included the GRACE (Gravity Recovery And Climate Experiment) satellite, launched in 2002, and the ESA's SMOS (Soil Moisture and Ocean Salinity) satellite, launched in 2009. Angara is a family of Russian rockets in development since the 1990's. The rockets are designed around modular components that allow a variety of configurations of varying capability. The first stage is comprised of one or more modules clustered together. The modules, known as URM-1, are each powered by an RD-191 rocket engine. The RD-191 is a single-chambered engine that uses kerosene and liquid oxygen as propellent. Successful test missions have flown with configurations using one and five URM-1 modules. Other configurations, with three or seven URM-1 units, have been proposed. The URM-2 stage is powered by an RD-0124A engine. The RD-0124A is a four chambered engine that uses kerosene and liquid oxygen as propellent. The Briz-M upper stage is used with some configurations, and a new cryogenic upper stage is under development. A successful suborbital test flight of the Angara 1.22PP was flown in July, 2014. The rocket included a single URM-1 booster and a URM-2 second stage. Angara 5 conducted its first flight in December, 2013. The successful mission placed a payload simulator into geostationary orbit. The Angara 5 included five URM-1 modules, a URM-2 stage, and a Briz-M upper stage. By Rex Hall and David J. Shayler.